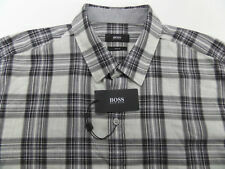 New ListingBOSS HUGO BOSS MEN'S BLACK LABEL REGULAR FIT SHIRT SIZE MEDIUM HARDLY WORN! LONG SLEEVE OXFORD SHIRT. COLOR PURPLE WILL SHINY SHADE. SLEEVE 33". 100% COTTON. HUGO BOSS Orange Label BUTTON DOWN Blue and White Paisley SHIRT Sz Mens S. Condition is Pre-owned. Shipped with USPS. BOSS HUGO BOSS MEN'S BLACK LABEL SLIM FIT SHIRT SIZE LARGE HARDLY WORN! Boss Short Sleeve Button Up. Shipped with USPS First Class Package. Really nice shirt. Size is large. No rips tears or stains. Thank you for supporting small business! 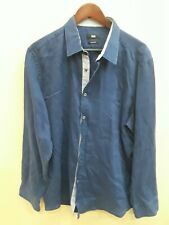 This is a Hugo Boss Long Sleeved Button Front Shirt, Size Large, Slim Fit. The shirt is cotton and features a 7 button front. From the shoulder to the bottom hem measures 30.5 inches, from pit to pit is 20 inches, and sleeves are 26 inches. It is in excellent pre owned condition. Shipped with USPS First Class Package. Mens Boss Shirt. Shipped with USPS First Class Package. Hugo Boss Long Sleeve shirt. C-Barnaba 50330846 059 Regular Fit The Retail Price is $155.00! Button-front Spread collar Curved hem Double-button barrel cuffs Signature logo metal tab on side seam Chest pocket Size L Chest measures 21.5" when lying flat, Length 31". Width, from pit to pit: 23". Shoulder, from shoulder seam to shoulder seam: 18.5". Color: White, Gray, Blue. Specifics: Checks Pattern. Great spot to find the perfect gift for the bro you know. Blue and White Stripes. Pictures taken with indoor lighting and outdoor, so that you can see variations in the color. The color is a light blue. 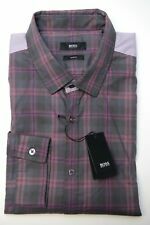 HUGO BOSS LUKAS GEOMETRIC L REGULAR BUTTON DOWN SHIRT MENS NWT . Condition is New with tags. Shipped with USPS First Class Package. 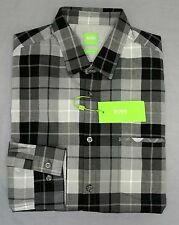 Armani Jeans Style 3Y6C25 Colour 2109 Shirt Large $185 - NWT. Condition is New with tags. Click Here to See All of Our Promotions [ T E R R A T Y ] (https://stores.ebay.com/terraty) [ Donate ] (https://contact.ebay.com/ws/eBayISAPI.dll?ReturnUserEmail&requested=terraty&frm=3692&iid=-1&de=off&redirect=0) [Contact Us To] (https://contact.ebay.com/ws/eBayISAPI.dll?ReturnUserEmail&requested=terraty&frm=3692&iid=-1&de=off&redirect=0) [ Men's Clothing ] (https://stores.ebay.com/terraty?_dmd=2&_nkw=men%27s) [ Women's Clothing ] (https://stores.ebay.com/terraty?_dmd=2&_nkw=women%27s) [ Kid's Clothing ] (https://stores.ebay.com/terraty/Kids-Clothing-/_i.html?_fsub=58063841013) [ Clearance ] (https://stores.ebay.com/terraty/Clearance-/_i.html?_fsub=56650954013) Clothing and textiles currently make up over 7% of the waste in US landfills. T-LANDON Tailored Shirt. Kent collar. Regular Fit. Regular fit. Round cuffs. Color: Blue with contrast dots pattern ". Standard length. Style with or without a tie to suit the occasion. Mint Condition! Length:(back edge of collar to hem).30". Point Collar. Sleeve:(shoulder seam to cuff).25". Fabric: 100% Cotton. Long Sleeve. Collar: 17". Chest: 24". Material: 65% Cotton, 30% Polyamid, 5% Elastane. Front Lenth: 30". Extra buttons (2) are still intact. Ecru and White. Length: 33".